Healthy People 2020 dataset provides a framework for action to reduce tobacco use to the point that it is no longer a public health problem for the Nation. 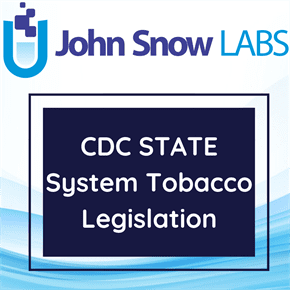 This dataset includes information related to the Healthy People 2020 Tobacco Use objectives, operational definitions, baselines, and targets. Baseline years may vary by objective. Targets represented correspond to the year 2020. In 2009, an estimated 20.6% of all American adults age 18 and older—46.6 million people—smoked, and every day another 850 young people age 12 to 17 began smoking on a daily basis. As a result of widespread tobacco use, approximately 443,000 Americans die from tobacco-related illnesses, such as cancer and heart disease, each year. An estimated 49,000 of these deaths are the result of secondhand smoke exposure. For every person who dies from tobacco use, another 20 suffer from at least one serious tobacco-related illness. Tobacco use poses a heavy burden on the U.S. economy and medical care system. Each year, cigarette smoking costs more than $193 billion in medical care costs, while secondhand smoke costs an additional $10 million. Tobacco use is thus one of the Nation’s deadliest and most costly public health challenges. – Tobacco Use Prevalence: Implementing policies to reduce tobacco use and initiation among youth and adults. – Health System Changes: Adopting policies and strategies to increase access, affordability, and use of smoking cessation services and treatments. – Social and Environmental Changes: Establishing policies to reduce exposure to secondhand smoke, increase the cost of tobacco, restrict tobacco advertising, and reduce illegal sales to minors. Preventing tobacco use and helping tobacco users quit can improve the health and quality of life for Americans of all ages. People who stop smoking greatly reduce their risk of disease and premature death. Benefits are greater for people who stop at earlier ages, but quitting tobacco use is beneficial at any age.